One of the best things about the holidays has got to be the cookies! I love thinking about, looking at, making, eating, and sharing all the colorful, festive, lovingly decorated cookies we conjure up. I think you'll agree that this is the time of year when we pull out all the stops - out come the cookie cutters, the star tips and piping bags, the sprinkles, frosting, candied cherries, nuts, and all sorts of other embellishments. It's just a fun time to savor! As much as I love French patisseries, when it comes to Christmas, I think of Italian-American bakeries and those festive cookie platters wrapped in cellophane and ribbon that are ready to be brought to someone's home. Growing up in Brooklyn, I would pass by many of these bakeries and admire their cookies. 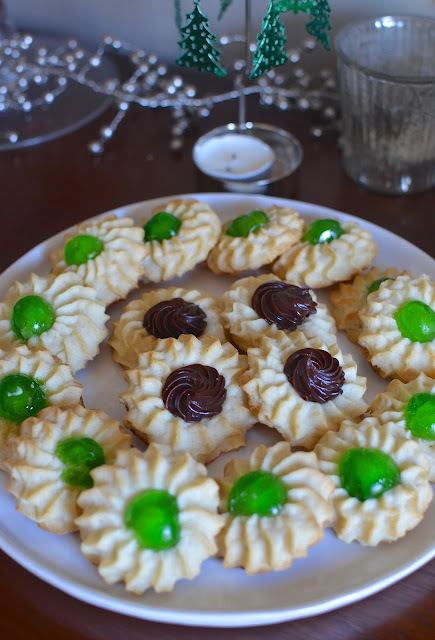 So when I was thinking about trying one or two new holiday cookie recipes (new to me, at least), I tend to think along the lines of those Italian-American offerings. So now, here's another one I can recommend: almond star cookies. These cookies are like a mix between classic butter cookies (like the ones from the blue tins) and almond paste cookies. I'd say it's like 60% butter cookie and 40% almond. They are quite similar to the Italian-American butter cookies I posted last year except these have almond paste in them. If you love almond paste as much as I do, I think you'd expect deep flavor as well as moisture and a little chewiness from it in your baked goods. True to form, it does that for these cookies. I dare say my family and I prefer these cookies over the plain butter ones. The little guy was practically shoving them into his mouth at an alarming rate so I'm glad even a half-recipe made a lot (about 40) since they were so popular. I shared some of this batch with a friend of mine. She told me she especially loved them because they were soft as opposed to hard, like she's used to when she buys them from a bakery. These cookies are buttery and almond-y, softer than what you'd expect, and with a slight chew, thanks to the almond paste. The recipe for these cookies comes from Saveur though my version is somewhat different since I made a few changes to suit my needs. I reluctantly omitted the kirsch since I don't have it, and added a splash of almond extract. And instead of maraschino cherries, I used candied cherries (sliced in half) on mine. I also opted to make thumbprint impressions on some and filled them with a swirl of chocolate ganache. I love Ferrera bakery in NYC's Little Italy and they have cookies topped with a round of piped chocolate ganache that always looks so good, so here is my take on it. I don't know if I'll have time to try any other 'new' cookie recipes since there are many family-favorites to make but I'm glad I finally tried these since I'd bookmarked the recipe for years now. I have a feeling I'll be making them again. This cookie dough - a combination of sweet butter cookie and almond paste - comes together into a soft mound. For piping, I transferred the dough into a large 16-inch disposable piping bag and used Ateco's #864 star tip. If you decide to double the recipe and make a big batch, work with half the cookie dough at a time. While the dough is soft, it does take some muscle and practice to pipe them out evenly. I find the best way is to hold the piping bag perpendicular to the baking sheet, with the tip positioned slightly above the sheet. Squeeze firmly without moving the bag until you have about a 1 1/2 inch round, then push the pastry bag down slightly, lift up and away. Sometimes it's easier said than done; and I just did the best I could! You could play around and pipe other shapes. I piped some simple 2-inch long strips or finger shapes and dipped some of them in ganache after baking and cooling. I left some plain, without any embellishment, and those were gobbled right up, too. You could press a few mini chocolate chips on them or maybe just sprinkle some colorful sanding sugar over the star cookies before baking, if you like. Keep a close eye on your cookies near the end of baking. They take about 14 minutes but watch for them to turn just lightly golden. You don't want them to brown too much. Now for the ganache filling. I was very excited about this part because what's more fun than stirring glossy ganache together and swirling them onto cookies! If you have some heavy cream in the fridge, it's handy for this recipe. You use 2 tablespoons of it in the cookie dough itself and I used some for the ganache. Since I was only looking to fill a handful of cookies, I made a small batch. To make things easy, I literally took mini chocolate chips (2 ounces) and a slightly smaller amount of heavy cream. I carefully warmed the cream up in the microwave, with a scant half teaspoon of corn syrup (for a little shine), then poured it over the chocolate chips. Let sit for about a minute, then slowly stir it together. If it is not completely melted, put it in the microwave on half-power, just 5 seconds at a time, stirring until just smooth. Let the ganache sit until it thickens enough that you can pipe it and it will maintain a swirl shape. I used Ateco's #30 tip, which is an 8-point tip that gives you these distinct groves that I really like. I had a wonderful helper in the kitchen for the piping. I discovered my son is into piping; we were decorating our annual gingerbread house (store-bought parts) the day before and he was happily welding the pastry bag and wanted a stab at filling these cookies. It was fun to watch. And not only did he play baking elf when we made these, he was also delivery elf (he and my husband delivered some cookies to a friend) so it's fair to say he earned his share of cookies. The original recipe for these cookies are for cherry-almond stars. I deviated from the cherry theme a bit. As I mentioned, I omitted the kirsch, or cherry-flavored brandy. I am very curious about it and no doubt, you would really have a true cherry-almond star cookie if you added the kirsch and then topped the cookies with either maraschino, or candied cherries like I did. My version might not be as heavy on the cherry flavor but we have chocolate so I think it's a fair trade! 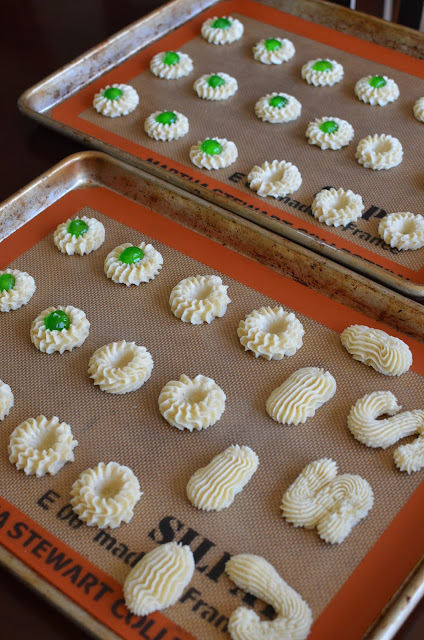 Have you started making holiday cookies and treats? I hope there's lots of deliciousness and variety in your cookie platters this holiday season! Line 2 baking sheets with parchment paper or silicon baking matts. Whisk flour, baking powder, and salt together in a bowl, and set aside. In the bowl of a stand mixer, beat butter and sugar on medium-high speed until pale and fluffy, about 2 minutes. In another bowl, beat the almond paste on medium-high speed until smooth. Add about one-quarter of the butter and sugar mixture and beat together until combined. Add remaining butter and sugar mixture and beat until smooth. Add egg until incorporated, scraping the sides and bottom of the bowl as needed. Add cream, vanilla and almond extracts, and beat until combined. On low-speed, gradually add the dry ingredient and mix until just incorporated. Bake cookies in the top and lower thirds of the oven, rotating midway, until just starting to turn golden - about 14 minutes. [If making thumbprints, I gently pressed them down again when I rotated the pans.] Keep a close eye on the cookies near the end to avoid over-browning. 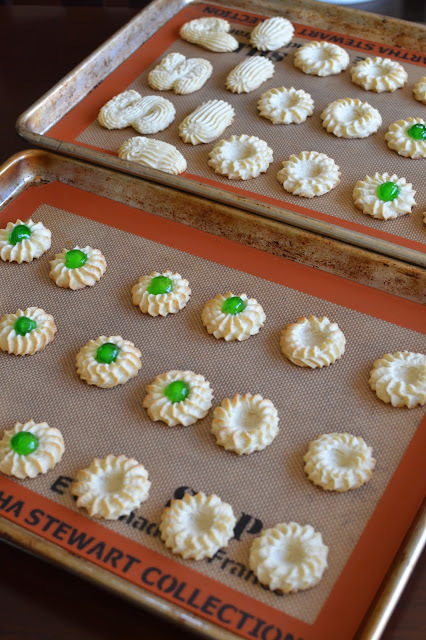 Let cookies cool on the sheet pan for a few minutes, before removing onto a wire rack to cool completely. 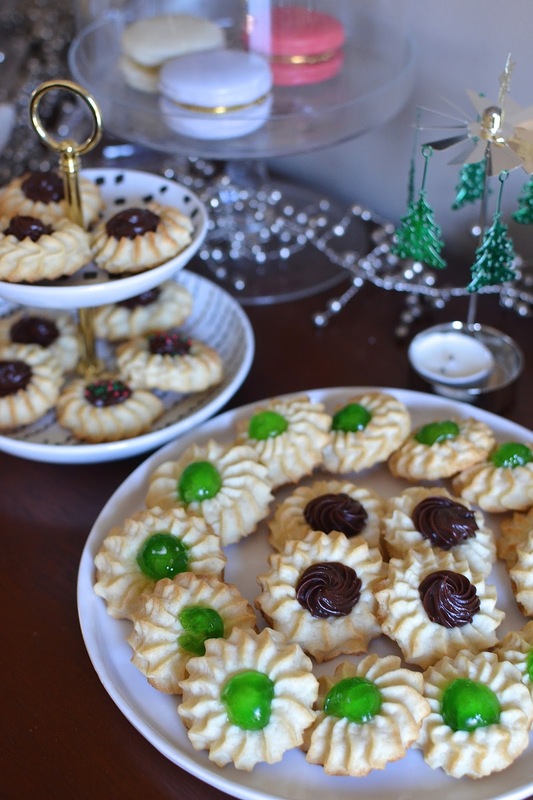 * If filling thumbprints with chocolate ganache, you can find a recipe here. The amount you need depends on how many thumbprints you're filling. To fill less than half of this batch, I used 2 ounces miniature chocolate chips and about a like amount of heavy cream. Let ganache sit, stirring occasionally, until it thickens enough to hold its shape when piped. I used Ateco tip #30 to pipe the swirl of ganache into the center of the cookies. Let sit until completely set. 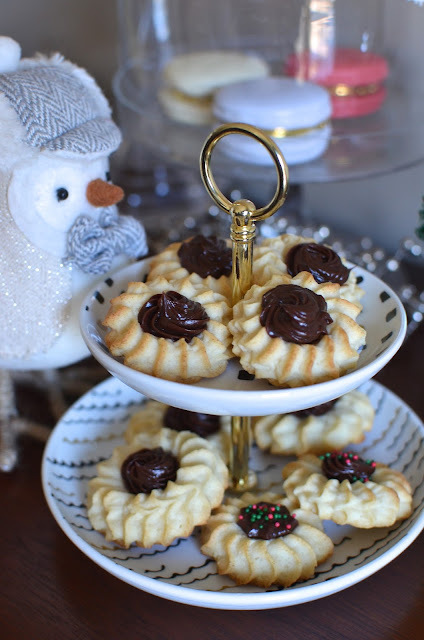 You have a great sous chef at home, Monica, no wonder these piped cookies turned out so perfectly perfect! Thanks...I would see the piped ganache at Ferrara (an Italian bakery in Little Italy in NYC) and I've always wanted to fill some cookies with a swirl like that! hehe...well, I may have had to smooth out and tap down the ones my little guy piped but I tell you, those tasted the best to me! ; ) Hope there are some good Christmas cookies in store for you this month. These cookies are so pretty! I especially like the ones with the candied cherries. Almond flavored baked goods are always my favorite! Thanks...you can't go wrong with chocolate but in cases like this, the almond and cherry is such a great combo with the similar flavors. I am always looking around for some new ideas, though my son likes the same sort of flavors on rotation. Your candied cherries sound perfect. I was very surprised when I first bought some one year to know they kept so long...then I realized! Hope you are having a great holiday season so far. Love to see a cute little chef here! :) And these star cookies look droolicious, Monica. The piping is perfect. Love love these. Can't wait to give them a try. The fellas were particularly just chowing down on these. I was surprised they were *that* popular. I love the flavor and texture too...almost don't want to admit it but I kind of like them plain, without any filling. These cookies are perfect, Monica! So fun that you made them with your son! He did an amazing job with the piping, they look gorgeous :) He definitely deserves extra cookies and bonus points for delivering them too! So festive and a must for any holiday season! These are wonderful Monica. Love that your son helped - he is a cutie! 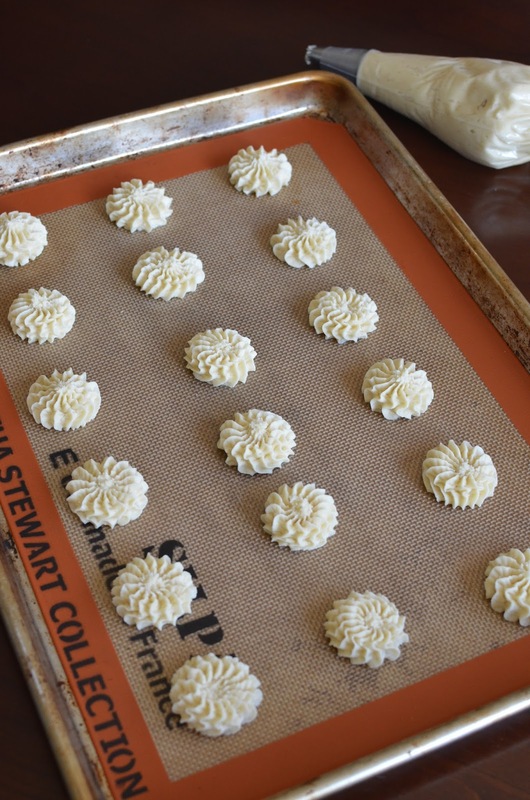 I just adore a good butter cookie and almond paste is a personal favorite - so these are for me! Love the colorful candy and the chocolate middles. So pretty - they are perfect. So many cookies, so little time! Have a great weekend. Agreed! Cookies are definitely one of the best parts about the holidays! I LOVE that you made these! We always always had these growing up (very Italian family) - I absolutely need to try making them myself - I think my family would go nuts! You have a wonderful person helping you, he looks so into it. Full of concentration. So glad to see him. This is a dream cookie Monica, a mix of butter cookies and almond ones, love love. These will vanish in any party for sure. They are gorgeous. Honestly, I love Italian style cookies, they are nuttier and buttery. So good. I agree, T' is the season of cookies. I need to try these. haha...thanks, Ash. He was into it...for a few moments. Piping is fun for everyone, I think! I did really enjoy these butter cookies with the almond paste. My son wants more, for sure! We are enjoying the unseasonably warm weather and I'm finishing up shopping so lots of time to savor the moments. You enjoy! Hi Monica, your son looks like a professional in the kitchen. 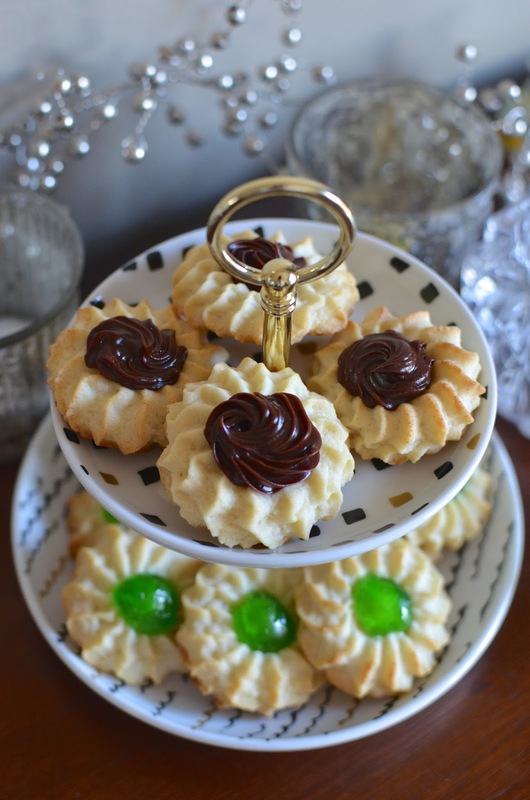 Beautiful looking cookies, I love baking with almond paste, so delicious! haha - I was telling my son about all the kind comments blogger friends have been making. Much appreciated! Happy cooking and baking this holiday season, Cheri! I love those cookies in the blue tin! I must give these a go because they sound like they were a complete hit! Wouldn't that be a wonderful option for food blogs! : ) Thanks, Ritu! Thank you. I need to make a stop at the closest Italian bakery this season, too. These cookies look so perfect for the festive season! Thank you, Jasline. Happy Holidays! These cookies look gorgeous, Monica! Love the chocolate center (: And anything with almond paste is always a winner in my book!